Check out our five-year Strategic Plan here! Check out our aligned Department Improvement Plans here! Site Improvement Plans are now available here! The purpose of Salt River Schools, in partnership with the Community, is to provide EXEMPLARY EDUCATION in a safe learning environment IMMERSED IN THE O’ODHAM and PIIPAASH CULTURES in order for all students to secure a successful future. Community empowerment, through culture, engagement, academic achievement and excellence. 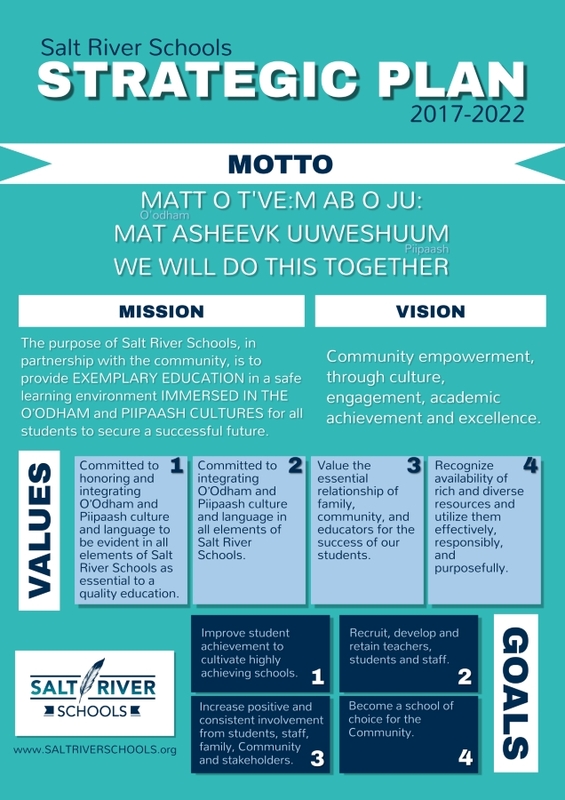 Committed to honoring and integrating O’Odham and Piipaash cultures and languages to be evident in all elements of Salt River Schools as essential to a quality education. Committed to integrating O’Odham and Piipaash cultures and languages in all elements of Salt River Schools. Value the essential relationship of family, Community and educators for the success of our students. Recognize availability of rich and diverse resources and utilize them effectively, responsibly and purposefully. Provide ongoing differentiated support to every school, staff member and student. Provide safe and secure schools (bully-free zones). Build a positive, flexible support with students, staff and families to find solutions to help all be successful. Create consistent, meaningful interactions, events and opportunities. Develop common scheduled times for events planned in advance that account for events at all schools. Communicate effectively to stakeholders/Community using the appropriate methods for the situation. Solicit input from stakeholders on ways to improve involvement and increase opportunities for stakeholders to participate in meaningful roles or committees. Integrate language fluency, Piipaash, O’Odham and cultural history and create a balance. Offer Internships, volunteer opportunities and college and career opportunities to prepare junior high and high school students for post-secondary opportunities. Develop and enhance partnerships with businesses, stakeholders, departments and others to provide students unique opportunities and experiences.